Ironically, in the now numerous accounts of how the current oil market came to collapse over the last few years and months, there are almost no references to Canada despite the importance of the oil economy to the nation. We have been mere bystanders in all of the complex series of events, and yet the impact of this will affect the Canadian economy for at least a decade. Canada has bet its entire economy on natural resource exploitation only to have it battered as if it were a Third World country, dependent for its survival on one key commodity. How did Canada come to this sorry state of affairs? The sudden plunge in global crude oil prices from over $100 a barrel to under $65 has been portrayed as a showdown between Saudi Arabia and the U.S., but the reality is more complex. Since the 1970s, Nigeria has sent a steady stream of high-quality crude oil to North American refineries. As recently as 2010, tankers delivered a million barrels a day. Then came the U.S. energy boom. By July of this year, oil imports from Nigeria had fallen to zero. Displaced by surging U.S. oil production, millions of barrels of Nigerian crude now head to India, Indonesia and China. But Middle Eastern nations are trying to entice the same buyers. This has set up a battle for market share that could reshape the Organization of the Petroleum Exporting Countries and fundamentally change the global market for oil. On Friday, crude prices dropped to their lowest level in five years after the International Energy Agencycut its forecast for global oil demand for the fifth time in six months. That signaled to investors that the world economy would struggle in the coming year, sending the Dow Jones Industrial Average tumbling by 315.51 points, or 1.8%, to 17280.83. That’s the Dow’s biggest weekly percentage loss in three years. Since June, the IEA has cut its demand forecast for 2015 by 800,000 barrels, while it says U.S. oil output will rise next year by 1.3 million barrels a day. The drop in global oil prices from over $110 a barrel to under $62 on Friday has been portrayed as a showdown between Saudi Arabia and the U.S., two of the world’s biggest oil producers. But the reality is more complex, involving Libyan rebels and Indonesian cabdrivers as well as Texas roughnecks and Middle Eastern oil ministers. It reflects both the surging supply of crude and the crumbling demand for oil. And the oil-price plunge may not end soon. Bank of America Merrill Lynch says U.S. oil prices could drop to $50 in 2015. The roots of the price collapse go back to 2008 near Cotulla, Texas, a tiny town between San Antonio and the Mexican border. This was where the first well was drilled into the Eagle Ford Shale. At the time, the U.S. pumped about 4.7 million barrels a day of crude oil. In 2009 and 2010, the global economy improved, demand for oil increased and crude prices rose, creating a large incentive to find new supplies. In Cotulla and elsewhere, U.S. drillers answered the call. “There was, for lack of a better term, an arms race for oil, and we found a ton of oil,” says Dean Hazelcorn, an oil trader at Coquest in Dallas. Today, two hundred drilling rigs blanket South Texas, steering metal bits deep underground into the rock. Once drilled and hydraulically fractured, these wells yield large volumes ofhigh-quality oil; at the moment, the U.S. is producing 8.9 million barrels a day, thanks to the Eagle Ford and other new oil fields. Americans aren’t pumping more gasoline or otherwise using up all that new crude, and under U.S. laws dating back to the 1970s, it has been almost impossible to export. As a result, American refineries snapped up inexpensive crude from Texas and North Dakota, using it to replace oil from Nigeria, Algeria, Angola and Brazil, and almost every other oil-producing nation except Canada. OPEC sent the U.S. 180.6 million barrels in August 2008, a month before the first Eagle Ford well; in September 2014, it shipped about half that, 87 million barrels. That is about 100 fewer tankers of crude arriving in U.S. ports. They went elsewhere. For a long time, it seemed like the world’s growing appetite for oil would soak up all the displaced crude. By 2011 prices began to hover between $90 and $100 a barrel and mostly stayed in that range. But earlier this year, another trend began to come into focus, catching Wall Street energy analysts and other market watchers by surprise. In March, many analysts predicted global demand for crude oil would grow by 1.4 million barrels a day in 2014, to 92.7 million barrels a day. That prediction proved wildly optimistic. Vikas Dwivedi, energy strategist with Macquarie Research, says a widespread deceleration of global economic growth sapped some demand. At the same time, several Asian currencies weakened against the U.S. dollar. The cost of filling up a gas tank in Indonesia, Thailand, India and Malaysia rose, just as these countries were phasing out fuel subsidies. In Jakarta and Mumbai, drivers cut back. Rising supply and falling demand both put downward pressure on prices. Throughout the summer, however, fears of violence in Iraq kept oil prices high as traders worried Islamic State fighters could cut the countrys oil output. Then two events tipped the market. In late June, The Wall Street Journal reported the U.S. government had given permission for the first exports of U.S. oil in a generation. While the ruling was limited in scope, the market saw it as the first crack in a long-standing ban on crude exports. 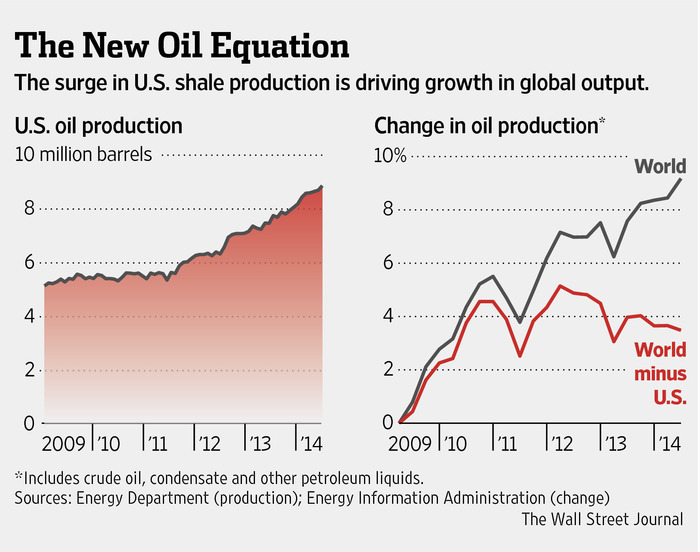 Not only was the U.S. importing fewer barrels of oil, it could soon begin exporting some, too. This news jolted oil markets; prices began to edge down from their summer peaks. On July 1, Libyan rebels agreed to open Es Sider and Ras Lanuf, two key oil-export terminals that had been closed for a year. Libyan oil sailed across the Mediterranean Sea into Europe. Already displaced from the U.S. Gulf Coast and eastern Canada, Nigerian oil was soon replaced in Europe, too. Increasingly, shipments of Nigerian crude headed toward China. Oil prices began to decline. 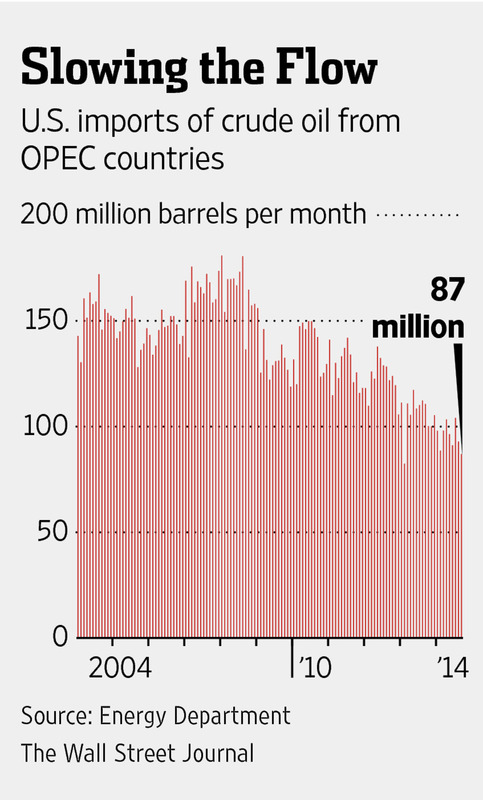 By the end of July, a barrel of U.S. crude fell below $100. 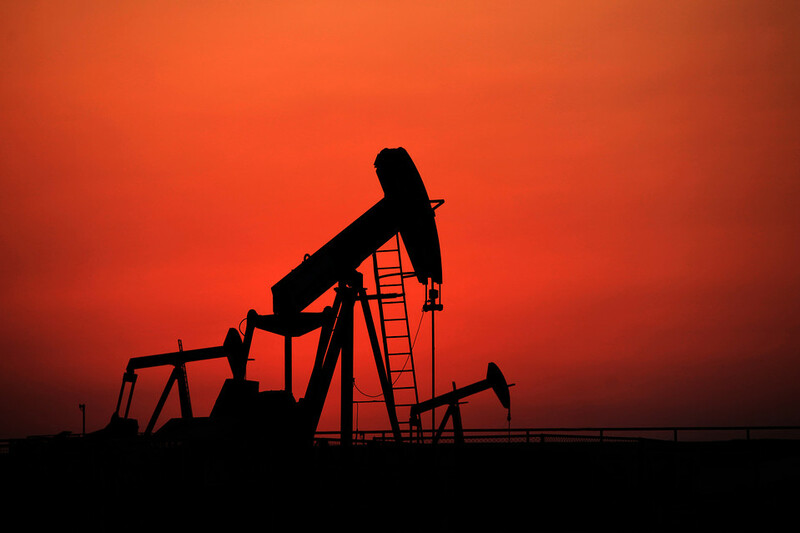 In early September, the IEA, a Paris-based energy watchdog, noted there had been a “pronounced slowdown in demand growth.” A month later, oil prices fell below $90 a barrel. Saudi Arabia didn’t want Nigeria to develop long-term relationships with refinery buyers in Asia. In late September, the kingdom decided to shore up its hold on them by, effectively, holding a sale. The Saudis cut their official crude price in Asia by $1 a barrel; within a week, Iran and Kuwait did the same. Two weeks later, the IEA again lowered its full-year projection of demand growth by 200,000 barrels a day to a meager annual increase of 700,000 barrels, nearly half of what it expected at the beginning of the year. Oil prices fell nearly $4 a barrel on the news. At this point, the oil market appeared to be in free fall. Of the 23 trading days in October, the price of crude fell by more than $1 on eight days. It rose by $1 on one day. Traders’ attention turned to OPEC, which has traditionally played the role of market stabilizer by cutting production when prices fall and raising production when prices rise. Many OPEC members, reliant on the cash oil brings in to pay for generous social programs, didn’t want to cut. Saudi Arabia’s powerful oil minister, Ali al-Naimi, was silent for weeks. The country had been burned in the past when it cut its oil output, only to see other countries continue to pump—and steal its customers. And it was already feeling competition, says Abudi Zein, chief operating officer of ClipperData, a New York firm that tracks global crude movement. Colombia, which historically has sent most of its oil to the U.S., is finding its biggest buyer this year is China, a critical market for OPEC, he said. At its regular meeting in Vienna in late November, the cartel kept production unchanged. U.S. and European oil prices fell another $7 per barrel.